September is starting off with a bang of confetti. My company just celebrated our 8th anniversary! (check out my happy dance on Instagram). I can’t quite believe it’s been that long, but time flies when you are doing something you love, right?! My heart is full and I want to say thank you to all who has supported me and AbbyDora Design over the years. 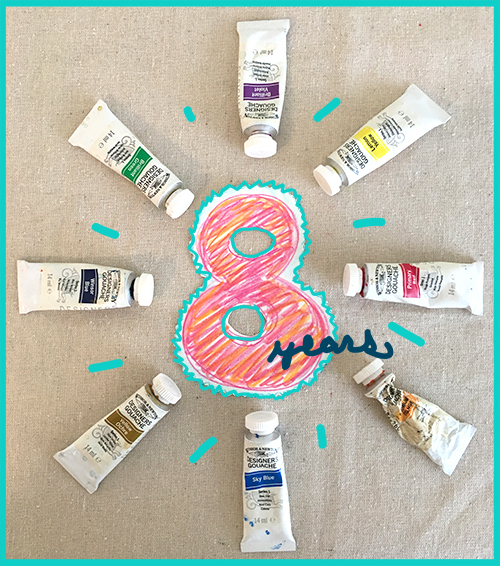 Here’s to a great 8th year! I also wanted tell you that this year AbbyDora Design will not be at Rochester’s Clothesline Festival. It’s a little painful, but after 3 years in a row, we needed a break. But don’t be too sad, because we will be showing at November’s Holiday Bazaar at Rochester’s Science Museum. I’ll be sharing the details and maybe even a sneak peak of new art closer to November.